All you need to know is that if you gave up on this title in the past then give it another go – your patience and perseverance will have been rewarded. As the title hits the teens, Danny Noonan / Duoshade is now Johnny Jukebox, but he is still in a band and, apparently, still a success (just like Danny Duoshade). Now get this – Johnny loves Loreli, who bears a strong resemblance to Sadie. Random, life altering events come and go as if in a drug-induced haze (like burning down your house ‘to shake things up’)….but is that because they are conducted under medical supervision and intervention??? Brown Bag is watching you…. By the end of the issue, when Johnny is using peyote to try and break down what appears to be a monumental and orchestrated facade, it feels as if the series has not only come full circle but also a climax is in sight. Johnny / Danny, with a wig in one hand and a gun in his other, makes a decision which is going to effect his, and Loreli’s lives forever. It may even have massive repercussions for the whole world. It is the title of the week. There you go – in a week when ‘The Walking Dead’ is out, another title gets top billing fom me. I can give no higher praise, but do go ahead and read it. If you have not read the other 12, go and find them and then read this. Issue 12 is the cherry on the top so far. Who knows the truth anymore and what is real in Danny / Johnny’s life? Who cares? Will we ever find out what the real truth is? 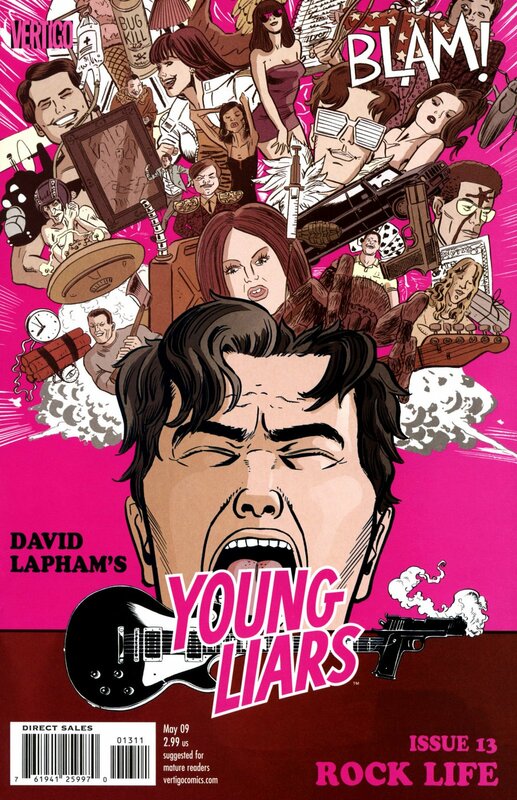 Note to David Lapham – Just keep delivering the goods and you can continue spinning tales (it is a real web of deceit – metaphorically and in reality…or are the Spiders from Mars a mere fantasy??) until you decide enough is enough and you decide to tell us what the hell ‘Young Liars’ is about. Until then, thank you for this wonderful installment, and a truly inspired cover – they, like the story inside, just get better and better.